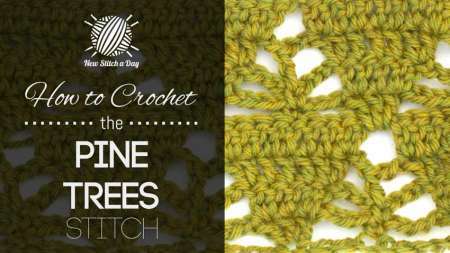 Have you discovered the site that sends you an email every day to teach you a new crochet stitch? I think it’s totally amazing! While I do not necessarily have time every single day to practice a new stitch, I like seeing the patterns or motifs. I certainly like having such a useful reference so handy on my laptop or tablet. The site offers patterns also. And a blog. And videos to follow for each new stitch. And free tutorials and online classes! It’s easy to sign up for their daily or weekly newsletter that will update you on all their offerings. I’ve also been pleased with their particular selection of patterns. You can find a gazillion sites online to show you how to chain, single crochet, etc. But, beyond Crochet 101, there has been a need online (and in English) that uses a multifaceted approach to teaching more complex stitches and motifs. If you learn better by seeing, or reading, or doing, this site has you covered. Should you also do that craft that uses only the one stick, the same stitch resources are available on the same site. I’m a confirmed crocheter, finding knitting to make me tense rather than relaxed. But, there are clearly many ambicraftous yarn users our there. 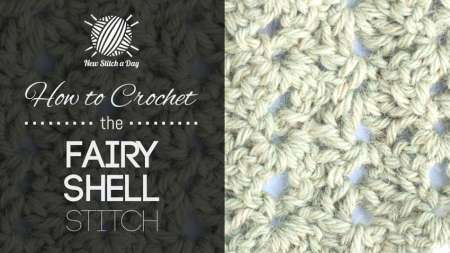 You can try your hand at the Fairy Shell stitch. If nothing else, the name is enchanting! 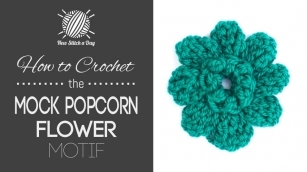 The Mock Popcorn Flower is a great way to use the popcorn stitch. And, if you’ve been reading my post for very long, you know how I love crocheted flowers. Working up a bouquet of these in a variety of colors would be so pretty. Great scrap project! There are a lot of other goodies on this site. You’ll get hooked just like I am! So, go on over and sign up for that newsletter so you don’t miss any stitch news.